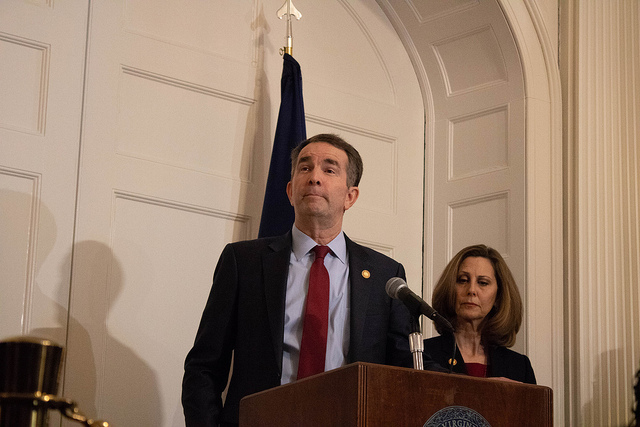 The scandals involving Virginia’s Governor, Lieutenant Governor and Attorney General are being felt from a statewide to a local level. Kojo explores the nearby effects of the Commonwealth’s crisis of leadership, and discusses how political uncertainty has disrupted local governance. KOJO NNAMDIYou're tuned in to The Kojo Nnamdi Show on WAMU 88.5. Welcome. Later in the broadcast, where does your recycling go? The answer has always depended on where you live, but the details may not be what you expect. WAMU's Jacob Fenston will be joining us shortly. But first, how is the commonwealth of Virginia's crisis of leadership affecting northern Virginia? Joining me in studio is Christian Dorsey. He is the Chair of the Arlington County Board and Principal Director of the WMATA Board of Directors. Christian Dorsey, thank you for joining us. CHRISTIAN DORSEYKojo, it's good to be with you today. NNAMDIIt's been 12 days since the initial news broke about Governor Northam's yearbook picture. Since then, it's been a nearly nonstop domino effect of blackface admissions and sexual assault accusations. You are not a member of the Virginia legislature, but you work with statewide officials and these are your colleagues in many respects. How have you been processing the news? DORSEYThis has been extremely difficult. You mentioned 12 days. It feels like it's been a lot longer. And you know, knowing the effected individuals personally and also understanding the gravity of what they have admitted to and what they're accused of, it's all been very difficult. And my constituents and people that I'm hearing from are all challenged by this. And you know, the business of the commonwealth of Virginia has been affected by this. NNAMDIYou count Lieutenant Governor Justin Fairfax as, quoting here, "A friend and an ally." After news of a second accusation of sexual assault broke last Friday, what did it take for you to come to the conclusion that he should step down? DORSEYWell, Kojo, it's not something that I arrived at lightly, but when you look at the accusations as serious as they are and the fact that we need to be fully heard and aired, it seems inconceivable that Lieutenant Governor Fairfax can do his job of being lieutenant governor in the commonwealth. He has to address these allegations in a way that produces some level of clarity moving forward. And in order to do that, he's not going to be able to perform in his role the way he was elected to. DORSEYHe's going to be certainly distracted, clearly. And if there is an investigation while that's going on, there's still going to be that cloud of people who have determined his guilt or his innocence, and that's going to become the story, not the job of being lieutenant governor of the commonwealth. So, that's why I suggested that he step aside and look to see this conclude in whatever way it can conclude, but the business of the commonwealth needs to continue. NNAMDIThe lieutenant governor himself has asked for due process and asked for an investigation. Are you concerned about jumping to conclusions given the seriousness of these accusations? DORSEYWell, I certainly haven't jumped to any conclusions. I think everybody has a right to have their allegations heard, and they also have a right to have the allegations defended. That needs to take place in whatever way it can, and I'm not quite sure what that is yet, who does the investigating, how it takes place. But while that's going on there is going to be a cloud under the lieutenant governor, and there's no way that he can avoid that. And it means that the people's business doesn't get done in the way that it needs to. NNAMDIHow about the argument that he might make, If I step down and an investigation subsequently clears me, my political career has been killed anyway because people came to the wrong conclusion. DORSEYWell, I see it a little bit differently. If in the event that there can be an investigation, which clears him, absolves him or brings any greater nuance to this whole situation, there's no reason why his political future can't resume. In fact, you can even see a mechanism whereby he could be appointed lieutenant governor again. I don't know what that all looks like, but to say that it's over regardless to me it doesn't make a whole lot of sense. And to me, there's an honorable path forward that preserves your ability to defend yourself in the way that you feel you need to be defended. NNAMDIIf Lieutenant Governor Justin Fairfax does not, refuses to resign his position, do you think he should be impeached? DORSEYNo. My understanding of the constitution of Virginia reserves impeachment for high crimes and misdemeanors committed while in office. That is not the vehicle to adjudicate these allegations. Unfortunately, since they are not only allegations that happened a long time ago without any conclusive evidence that's been earthed at this point, not sure that we have a vehicle to, to make a definitive judgment here. But I am very clear that impeachment is absolutely not the vehicle to air this and it's unfortunate that that's been a part of the conversation. NNAMDIOur guest is Christian Dorsey. He's the Chair of the Arlington County Board. He's also the Principal Director of the WMATA Board of Directions, of Directors. You've also responded to Governor Northam's saying, quoting here, "There is only one honorable path, and I hope he takes it." So far, there's no indication that the governor will resign. His past actions, while steeped in racism, are not, however, illegal. How would it square with you if after all this Justin Fairfax turns out to be the only top democrat ousted from office? DORSEYYeah. I think that would be a problem, because you know, I talked about with Lieutenant Governor Fairfax. It's the ability to lead and do the job that's at issue with me, and the same is true for Governor Northam. You know, Kojo, as hurtful and disgraceful as the, the images that are associated with the governor were, and the fact that it took him the better part of a day to conclude that he wasn't a part of it, bleating by indication that he could have been engaged in behavior like that while he was in med school. DORSEYAs hurtful, as disappointing as that is for me personally, really the issue with him staying in office has to do with his leadership after that. Not taking, not being accountable at the press conference, not fully understanding the gravity of the pain that he's caused, and then not having a clear path forward for how he wanted to lead the commonwealth towards reconciliation and progress. Those to me were the disqualifying factors and why I think he is not fit to continue as governor. NNAMDIHere is Omar in Burke, Virginia. OMARYeah. I just want to say that I don't agree absolutely with what the governor did like 35 years ago, but I believe he should have the chance to, to govern and to do the job he was elected to do. I believe his apology is enough at this moment. And as for the lieutenant governor, I believe that he should get a fair investigation on these allegations. And if it turns out to be legit, I believe he should resign. But definitely not -- at this moment I don't want to jump to any, to any conclusions -- it's premature to indict him now. OMARAnd I, and I believe we should just focus on the challenges that Virginia's facing right now and look at it for the future. NNAMDIOkay. Thank you very much for your call. How difficult is it to focus on the challenges Virginia is facing ahead in this current scandal-ridden environment? DORSEYWell, it's extremely difficult, and that factors into the calls for resignation. Wherever these men go, whatever they do, there is this cloud of are they a racist. Should they be in office? Have they committed sexual violence against women? Should they be in office? That informs everything that they do, the reception that they get wherever they go, their ability to, you know, actually do work, because people don't know whether they're going to be here months from now. These are all ways in which they are compromised. DORSEYIn a perfect world, I think the caller raises great points. We would know everything that there is to know. We would fully flesh out all of these details, but that's unfortunately not the world that we live in. People have reached conclusions. People will attach them to how they, they view the governor and the lieutenant governor and the attorney general, and that's why they're extremely compromised at this point. NNAMDIWhen it comes to Attorney General Mark Herring, who admitted to wearing blackface in college, does his admission and apology come across differently than Governor Northam's? DORSEYWell, this is a case where Mark Herring has been elevated by the fact that the other people performed so badly and that they dealt with it so badly. You know, Mark Herring called for Ralph Northam's resignation and only subsequent to that did he admit his own incident, when he used blackface when he was a young man. A better leader would have admitted that when he was calling for Governor Northam's resignation. DORSEYBut given that he did admit to something before it was revealed by others, he's been elevated in comparison. Certainly there is a qualitative difference there, but by no means am I lionizing Mark Herring, because a better man would have absolutely said that, admitted his own past, when he was calling for Ralph Northam to resign. NNAMDIIt's clear that all this has taken a toll on morale and has consumed Richmond for more than a week, but how is this affecting, in your view, the crucial final weeks of the general assembly session. From your perspective, has the past week and a half of scandal distracted from the commonwealth's legislative agenda? DORSEYWell, I think it certainly has distracted from it. And if we'll remember, this sort of began or this was preceded by a pretty contentious conversation both in the commonwealth and nationally about an abortion bill sponsored by Kathy Tran. And certainly that bill has not been adequately considered given the national firestorm. And then subsequent to this, we've had the business of trying to complete the budget, which has real implications for people, who file their tax returns in April. DORSEYAnd you know, it's currently unclear as to exactly what the resolution will be to the governor's budget and the legislature's consideration of it. We've, we've kind of lost a week of real substantive activity as we've been dealing with these other, other issues. I don't mean to say that any of this is permanent or catastrophic, but it's certainly been a week in a short session of the legislature that we haven't been really able to focus on the legislative business before us. NNAMDIWell, despite all that's been going on, Governor Northam nevertheless signed a huge incentive package for Amazon last week that's very important to Arlington. Is any part of that package in jeopardy here? DORSEYNo, that's been signed into law. So, it appears that at least that is not going to be subject to any concerns with regard to what's going on with the governor, attorney general and lieutenant governor, and Arlington itself is going to be considering its own Amazon package in the, the weeks ahead. So, it appears that that has not been affected. But there are other things that remain unaddressed. DORSEYYou know, we were looking to see whether or not there was going to be at least conversations about better balancing the state's commitments to funding metro. While we didn't expect any big changes this year, I know those conversations are likely on hold indefinitely. And otherwise, we just don't quite know whether or not there's going to be the willingness for parties to engage not knowing how the leadership structure's going to be after this spring. NNAMDII know you have had to have been noticing that Amazon's deal in New York seems to have been falling apart. Does that impact Arlington in any way? DORSEYNo. And from everything that I understand, Amazon is still looking to do in New York what it said it was going to do in November, so that should have no effect on Arlington. But I certainly understand that if they do make a change in New York that would have dramatic consequences which would almost mean that we would have to sort of look at Amazon anew if, if they were going to focus their efforts on Arlington and not do anything anywhere else. NNAMDIHere's Donnie in Washington DC. Donnie, you're on the air. Go ahead, please. DONNIEThank you, Kojo. While all these democratic politicians have been jumping all over their governor and attorney general, I don't know if they even know that the Virginia House of Delegates failed to ratify the ERA amendment, the equal rights amendment to the constitution. That's kind of a civil rights issue that I think is important or that the Trump administration is opening up 50 percent of the wetlands to development. You know, if you live near the Chesapeake bay, that's pretty important, or oil exploration off of the coast of Virginia. That's pretty important too. Offshore drilling, does the Virginia House of Delegates want to see an oil spill? NNAMDIWhat, what do you feel all of this has to do with the three officials that we're talking about? DONNIEBecause they're, they're more concerned about a photo, which is distasteful, granted. It's not in good taste hardly. It's offensive, but a photograph in a yearbook 35 years ago doesn't have the impact of an oil spill, which they're not paying attention to offshore oil drilling off Virginia's coast. NNAMDIWell, let me, let me, let me ask Christian Dorsey about that, either whether, A, you're not paying attention to other issues, or B, in response to the Me Too movement and accusations of sexual assault in the case of the lieutenant governor, do you think the no tolerance approach the democrats have taken up is effective in placing the party on a moral high ground? And what does it lose when three democratic officials are being attacked either for racist photographs or racist actions taken in the past or for alleged sexual assault? DORSEYWell, you know, principles should not be situationally applied only so that they apply to people, who are not from your party who don't share your world view. So, generally I certainly think that principles that democrats and progressives espouse ought to be applied consistently. However, we do have to make sure that no tolerance provides a room for nuance and context. When we look at the array of offenses that one can commit, there are certainly, I think, degrees to which those are offensive in and of their own right. DORSEYAnd then I do believe that there are ways in which people can use those as learning and growing experiences. Not saying that that is applied to each and every case that we're talking about in Virginia, but we do have to have the ability to look at each case on a case by case basis and determine what is appropriate. And that's something that I think we're still struggling with in this era of making sure that we value every person's voice and make sure we don't have systemic oppression of people, who have been marginalized in the past. NNAMDIAlmost out of time, but here's Arlene in Arlington, Virginia. Arlene, your turn. ARLENEYeah, hi. Thank you for having me. Yes. I live in Virginia. I have, of course, been following everything going on with the governor, lieutenant governor and attorney general. I am African American, and I have been very upset about the calls for them to resign so quickly. I think that that seems to be happening for so many different situations in our government, and I think that it's not a good way to go. I think we should have investigations before we call for people to resign knee jerk, sort of like McCarthy-esque almost to me. NNAMDII know. As I said, we're almost out of time, so allow me to have Christian Dorsey respond. A lot of people are concerned about the first news source that broke the stories about the governor and about Justin Fairfax being a far right conservative news source quote/unquote "has an agenda" in the minds of some people. DORSEYWhile I think that's very clear and that's very true, doesn't mean that we discount what the actual allegations or the offenses are. And certainly when it comes to Ralph Northam like I said, there were for me opportunities for him to demonstrate clear leadership even with the blackface photos that would've showed me his fitness to govern. Unfortunately, he didn't demonstrate that. DORSEYThe lieutenant governor, we look at in a different case. Certainly these allegations are serious. They're allegations of crimes. They need to be investigated to the full extent, but the question comes as to whether or not he can lead while that's going on. So, I understand the whole idea that we want to make sure we give everyone their due to challenge any accusations that are before them, but we can't, you know, pretend that that can take place and people can go about doing their job easily or with dignity. NNAMDINot business as usual. Christian Dorsey is the Chair of the Arlington County Board and Principal Director of the WMATA Board of Directors. Thank you so much for joining us. NNAMDIWe're going to take a short break. When we come back, where does your recycling go? Do you know? Do you know? The answer has always depended on where you live, but the details may not be what you expect. Listen to WAMU's Jacob Fenston and environmental service officials who'll be joining us shortly. I'm Kojo Nnamdi.